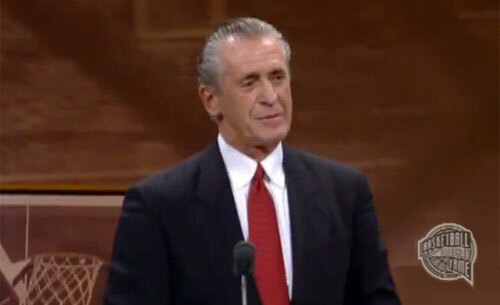 Legendary NBA coach and Miami Heat President, Pat Riley, has been named the keynote speaker at the annual Sioux Falls Chamber of Commerce 107th annual meeting scheduled to be held on Tuesday, October 22, 2013. The event will be held at the Sioux Falls Convention Center, beginning with a reception at 5:30 p.m. with the dinner and program starting at 7 p.m. The cost is $80 per person for Chamber members or $160 per person for non-members. Reserved tables of 10 are available ($800 per table). Chamber members can pre-order tickets by contacting Maddie Gutierrez at the Sioux Falls Area Chamber of Commerce at mgutierrez@siouxfalls.com. Pat Riley is considered one of the greatest basketball coaches of all time. He currently stands as the all-time leader in both regular season and postseason victories for both the Los Angeles Lakers and Miami Heat. Riley is not only one of basketball’s winningest coaches, but his speeches before hundreds of corporations have earned him the title of “America’s Greatest Motivational Speaker.” He has been rated by Success Magazine as “The best in his field.” Riley has also completed an award winning 30-minute motivational video entitled “Teamwork” in which he applies his winning philosophies to business and life in general. Sports Speakers 360 is a booking agent for motivational sports speakers. If you would like to book sports legends like Pat Riley for a speaking engagement, autograph signing, guest appearance, product endorsement, charity fundraiser or corporate event, contact our booking agent for appearance and speaker fees or call 1.855.303.5450.